Oil and gas production in the offshore areas includes deep waters and intense water environments. For operation in such kind of environment, an equipment with good reliability and low maintenance cost is required. Carbon Dioxide and hydrogen sulfide are the main corrosive environments that are referred while choosing an alloy for marine and oil/gas applications. Choosing the corrosion resistant alloys (CRAs) for refining and transportation of oil and gas can be a complicated procedure that if handled inadequately can cause flaws in applications and misunderstanding about the functionality of alloys in the specific application conditions. CRAs are used by people and industries in the diverse ways such as for flowline conditions. The research facilities generally initiate a test program that includes simulating the specific part of the field condition under analysis for example onshore or offshore. A specific range of alloys is chosen that describes a feasible range of alternatives. Instead testing all possible alloys, it is more affordable and takes less time to analyze some CRAs. Similarly changes in crucial application parts like elemental sulfur can have a significant effect on the stress corrosion cracking resistance, essential factor in the choice of alloy. Stainless steel 316 is extensively used for surface piping, vessel cladding and line pipe. But it is damaged by pitting attack when exposed to sea water at temperature about 20oC and above. The duplex stainless steels are prone to localized corrosion in availability of minor magnitudes of oxygen and hydrogen sulfide. Additionally, cracking may occur in presence of H2S. The duplex stainless steels are cold processed for reinforcing that will not significantly affect their corrosion resistance property in carbon dioxide or sodium chloride (CO2/NaCl). They are not extremely sensitive to chloride magnitude excluding the high chloride concentrations. Some gas streams have a profound influence on these alloys such as elemental sulfur. Sulfur is responsible for pitting and catastrophic cracking of these alloys under specific conditions, however Hastelloy C-276 is extremely resistant to such kind of corrosion and cracking. For both topside and subsea equipment applications the materials chosen are austenitic and duplex stainless steels, nickel alloys and cupronickel. Lower weight in topside is significant offshore as it offers economical solution by providing reduction in structural steel and jacket steel weights. The offshore sites utilize extensive magnitudes of marine water for fire extinguishing, quenching and water injection, producing potable water, sanitation and others. The equipments to deal with this involve many thousand tonnage of pipes, pipe fittings, pumps, valves and other components. Cupronickel 90/10 is used on board ship that proves to become more economical solution for these applications as compare to traditional galvanized steels. High alloy stainless steels are also used. For designing systems using 90/10 cupronickel, flow velocity is a limiting factor when large flow speed occurs that causes intense turbulence in the downstream areas. It causes corrosion and erosion in 90/10 Cu-Ni alloy. It is important to construct systems at flow speeds that are suitable to alloy when turbulence occurs. This is followed in the latest seawater processing units. The established flow rates about 3m/sec is for pipe of 100mm diameter that is larger than galvanized steel. Hence using 90/10 cupronickel is a more cost saving option for pipe production than steel. Several thousand numbers of cupronickel 90/10 pipelines have been installed in the offshore units within last 15 years. 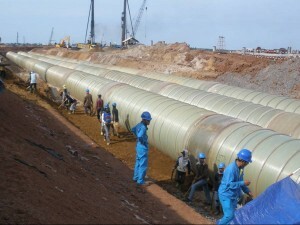 The stainless steel pipes for seawater systems produced for concrete gravity platforms are connected with oil storage or seawater ballast tanks in the base. The piping is frequently subjected to seawater and crude oil consisting of sulfides. It caused breakdown and spalling in the cement lines because of attack on steel pipe. However 90/10 cupronickel is technical fit for use in the sea water conditions, it is mildly prone to attack in sulfide based oil. It is because sulfides are included into the layers on the surface of alloy hence damaging its protection layer. It can ultimately cause aerated seawater corrosion. However stainless steels prevent corrosion due to sulfides, the austenitic stainless steel type 316 is sensitive to pitting and crevice corrosion in chloride containing waters like seawater. Stainless steels subjected to marine water, specifically in the protection regions are attacked by pitting and crevice corrosion. This localized corrosion resistance is enhanced by increasing chromium, molybdenum and nitrogen contents to offer complete prevention from crevice attack in seawater. General corrosion of stainless steels in marine water is mild. Even in the fast running seawater, the steels remain resistant and cavitaiton is prevented, the surface is isolated from the effect of velocities. Hence stainless steel pipes are more commonly used. The attack on carbon steel and stainless steels in deaerated seawater is caused by oxygen content. At high speeds as occurred on pumps and valves, corrosion degree on carbon steel is extremely high therefore high nickel alloys must be utilized. The stainless steels are resistant to pitting and crevice corrosion in deaerated seawater at neutral pH, these mechanisms are based on differential aeration cells. At minor oxygen contents, the cells are inactive. Stainless steel 316 offers suitable performance in the hot deaerated seawater. A water injection system includes lift pumps, pipe valves, filters, deaeration tower and deaerator, it is almost identical to topside seawater systems, 90/10 cupronickel material is used for pumps and filters. After deaeration that is obtained physically and chemically, the corrosiveness of seawater is widely reduced. Carbon steel pipe can be employed when the oxygen content is small however where large flow rates occur, stainless steel types are demanded such as in reducers, valves and pumps. In the large pressure conditions, duplex stainless steels are commonly installed for major parts due to their high mechanical strength hence they are weight saving. Specifically duplex stainless steels are commonly employed for input pumps as they offer great resistance to pitting and crevice corrosion. Corrosion resistant steels and alloys are used for topside process pipes and vessels. The use of corrosion preventing materials in offshore is totally unlike to the onshore configurations. Standard austenitic stainless steel types and diverse media and high nickel alloys offer good erosion and corrosion resistance in the wet gas streams in the high flow rates. In few conditions use of corrosion resistant alloys is frequently possible to decrease the pipe size hence allowing larger velocity flow and considerable reduction in pipe weight. Duplex stainless steel is used in smaller diameter as compare to traditional steel, offers greater corrosion resistance. The main processing operations conducted on offshore platforms include oil and gas separation and producing potable water, drying gas, chemicals recovery for example methanol, glycol included for containment of hydrate production and flaring gas. Gas compression for reinjection is usually needed. Considering the stainless steel and nickel alloys, the major factors causing general and localized corrosion, chloride stress corrosion cracking and sulphide based stress cracking are H2S, pH, chloride %, temperature and oxygen. pH is the main factor influencing the threshold temperature for chloride stress cracking of stainless steels and hydrogen sulfide threshold for materials vulnerable to sulfide stress cracking. Among the series of 300 stainless steel, 316l is commonly utilized for pipe and tube on offshore platforms. Following the fact that well fluids do not contain oxygen, unless oxygen is available during treatment, stainless steel 316l offers good performance against pitting, crevice corrosion and chloride induced SCC. Use of duplex stainless steels such as 2205 duplex stainless steel grade for topside piping and vessel applications in North Sea site has increased significantly in the past 5 years, moreover in using for downhole production tubes and subsea flow lines. The good mechanical strength, resistance to corrosion, pitting and chloride SCC and superior weldability make it a great material for wet carbon dioxide service in processing system applications. It is not prone to erosion/corrosion in wet carbon dioxide environments at velocities significantly more than those to be encountered in the topside process piping systems and can be judiciously used to protect topside weight compared with inhibited carbon steel including considerable corrosion allowance. 2205 duplex stainless steel can also operate at -50oC therefore it is used in flare piping units. Its service is acceptable for sour gas in annealed conditions offering hardness below 28Rc. Significantly used nickel alloys are Alloy 825 and alloy 625. Incoloy 825 has been widely used as process piping in the several oil and gas units in the United Kingdom in the starting of the decade. It has been utilized in mildly severe environments containing 30% carbon dioxide and 100 ppm H2S at 500 bar pressure and 100oC temperature on the base of expecting suitable resistance to stress corrosion cracking. Incoloy 825 offers good pitting resistance in the anerobic conditions and suitable performance. Pipe cladding with alloy 825 is significant for process piping applications, tees and bends. It is also used in gas turbine exhaust pipes that need to operate in chloride media causing stress corrosion cracking of mildly resistant alloys. Use of excellent general and localized corrosion resisting metal in severe, small pH and high chloride containing media in presence of H2S. Inconel 625 is employed in waste water draining systems with low pH concentrated chloride effluent. It offers excellent crevice corrosion resistance in the presence of acid chlorides. It is also used in weld overlaying and welding corrosion resistance alloys. It is outstandingly acquiescent to overlaying by TIG or synergic pulsed MIG welding that is vastly used for internal overlay of valves and other parts and heat exchanger tube sheet surfacing. Inconel 625 plate is available at Heanjia Super-Metals now. Stainless steels and nickel base alloys are utilized for subsea pipes and flow lines. These are durable and versatile materials that are fit for use in the flow lines. In few conditions, gas deposits consist of considerable magnitude of carbon dioxide. It accelerates the corrosion of carbon steels in regions where water phases are available causing sweet gas attack. However preventers are efficient in limiting the corrosion level in carbon dioxide, in other environments they are ineffective or costly. Duplex stainless steel 2205 UNS S31803 is fit for use in the numerous offshore plants in Netherlands. However the initial cost of purchasing duplex stainless steel piping is higher than carbon steel, they prove to be more economical in terms of their performance than their carbon steel counterparts. 2205 duplex steel has ability to develop corrosive gas from subsea finishing point and to transmit it to a processing unit, saving platform and device expenditures. Discards preventers, their storage and input facilities save cost significantly. 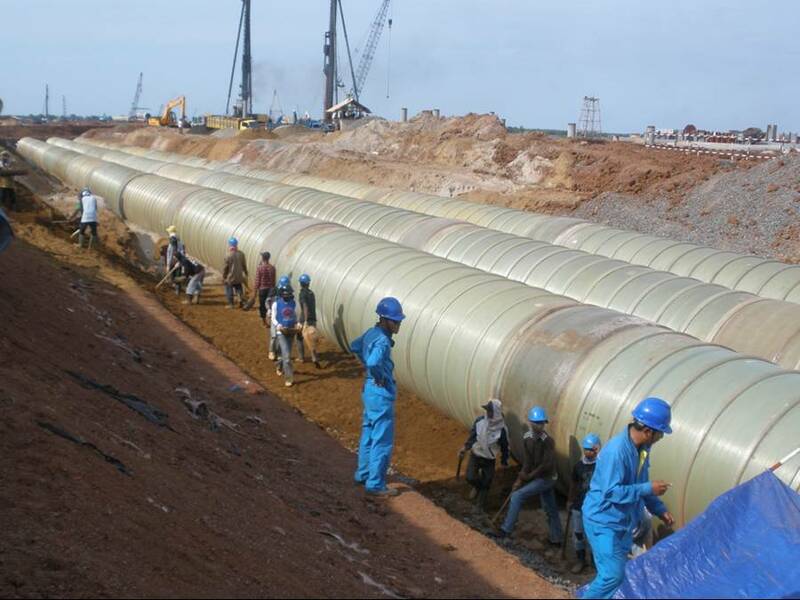 In the past three to four years, alloy-clad pipes are used in flow lines and subsea template pipes. Major problems with cathodic security of stainless steels put a question mark on the resistance offered by duplex stainless steels to sour conditions. The alloys employed for clad layer are SS 316l, Incoloy 825 and alloy 625. Splash area sheathing of risers:It has been found that concrete cladding of hot risers can be harmful. The splash zone cladding is sensitive to physical damage from floating materials and high oxygenated marine water on the hot metal surface may result in catastrophic attack. Many cases have been seen in Arabian Gulf and in North Sea causing wide fire damage and oil well damage in one case. For the protection of splash areas metal shielding by using Monel alloy 400 has been widely used for security. Cupronickel 90/10 is also used in the sheathing applications. Pump Columns: Vertical lift pumps are widely utilized to transfer seawater to the operation plant. The casing and impeller are positioned below the low tide level at the end of the vertical column pipes that are connected to the jacket. The column pipes are a significant part of the systems. Pumps are made from grade 316 stainless steel that offers outstanding resistance to high speed seawater and is unaffected from pitting. Expansion bellows: Expansion bellows are used to compensate the size change in pipes while service at the high or subzero temperatures, for example in the gas turbine exhaust systems. Stainless steel 316l, 304l are the significant materials for them but they cannot withstand attack in the high temperature chloride induced stress corrosion cracking in the salt conditions. Therefore high nickel alloys Incoloy 825 and Inconel 625 are used. In Europe and US markets alloy 825, alloy 600 and alloy 400 are commonly used in bellows production.